Image: A. Messerschmidt/WireImage Graham Denholm/Getty Images Jean Catuffe/Getty Images Julian Finney/Getty Images. Design: Allison Kahler/StyleCaster. Serena Williams is a tennis champion, a four-time Olympic gold medalist and one of the greatest athletes in history. She's also a fashion icon who has never sacrificed her style on the tennis court. 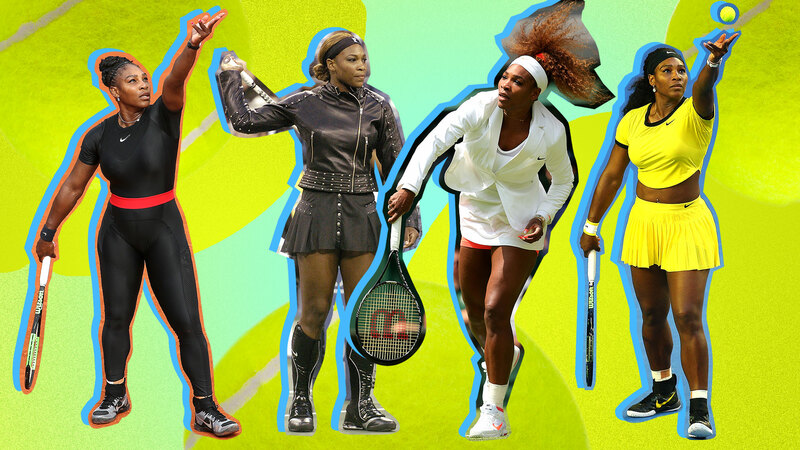 Over the years, Williams has worn many memorable — and fashion-forward — looks on the tennis court. From her early-day outfits to her recent headline-making catsuit and tutu, Williams is making tennis history in more ways than one. To celebrate her fashion, we've collected the boldest, most iconic looks she's worn over the years. Fashion and sports aren't mutually exclusive. In fact, they go hand in hand. Let Williams prove that to you. Williams made headlines for her post-pregnancy catsuit in 2018 (more on that later), but her first-ever catsuit was at the 2002 U.S. Open, where she wore a skin-tight Puma catsuit, accessorized, of course, with a $29,000 Harry Winston bracelet according to The Washington Post. For Kids' Day at the 2004 U.S. Open, Williams wore denim — yes, denim — on the tennis court. The look, which she said was inspired by James Dean, consisted of a pleated denim miniskirt and a studded Nike tank top. Williams made a statement with her bikelike ensemble at the 2004 U.S. Open. The look consisted of a leather jacket with a matching pleated skirt and boots. Williams kept it light and airy at the 2004 WTA Tour Championships, where she wore a bright-yellow skirt with a white shirt with matching yellow details. Williams revamped her signature black catsuit with a pink-and-white one for the 2005 NASDAQ-100 Open. The look included zipper details and was accessorized with a matching headband and hair ties. Image: John Capella/Sports Imagery/Getty Images. 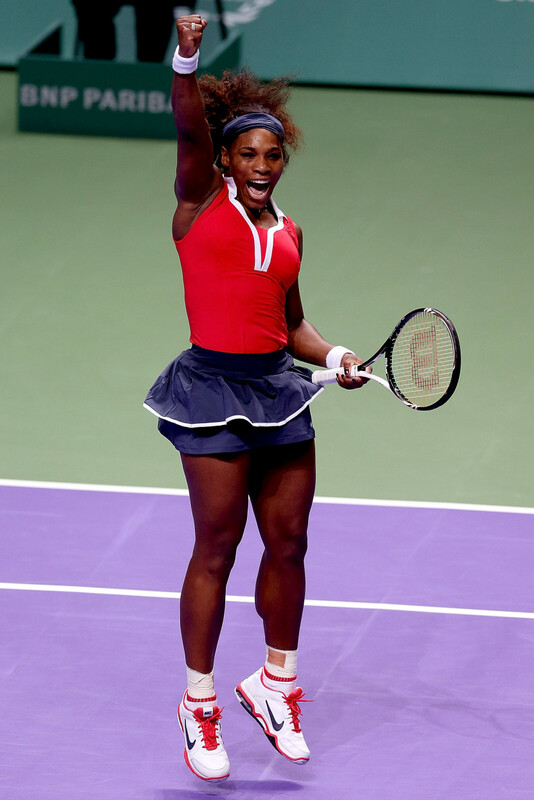 Williams continued her Nike love with a navy-and-pink dress for the 2007 Sony Ericsson Open, which she accessorized with a hot-pink headband and clean white sneakers. 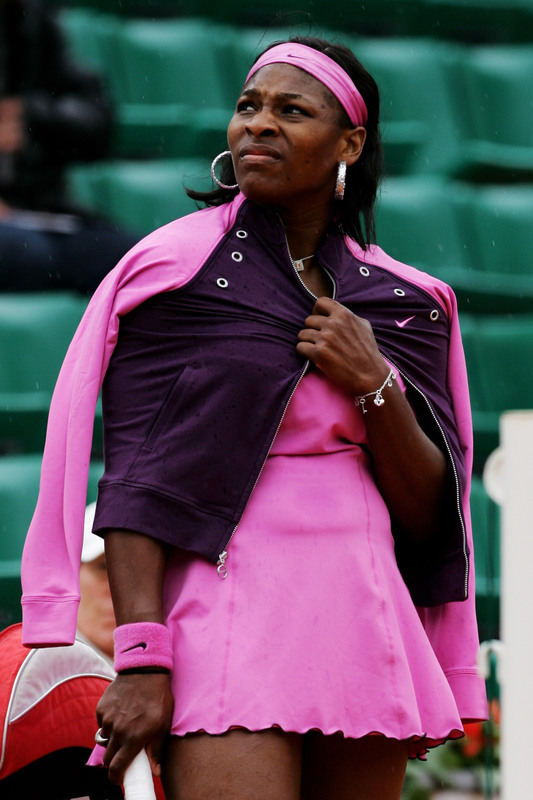 For the 2007 French Open, Williams arrived in a head-to-toe pink look consisting of a pink-and-black bomber jacket with a matching pink dress, headband and wristband. 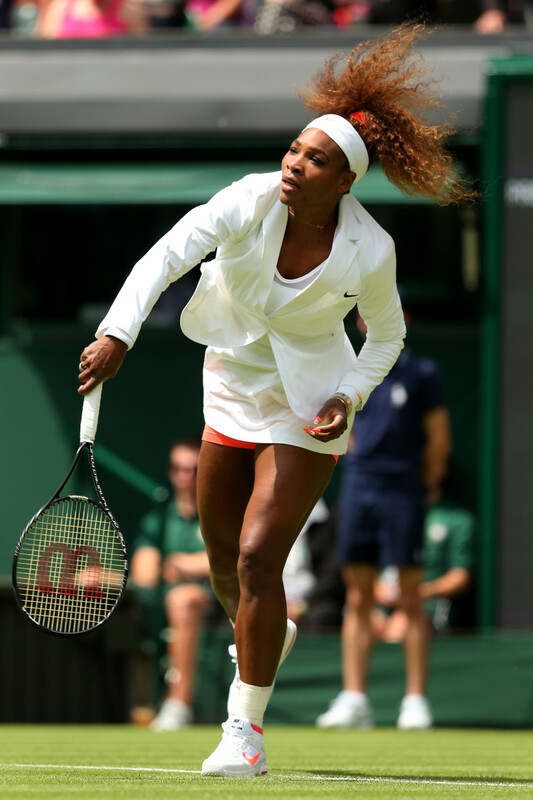 Williams turned heads when she arrived at the 2008 Wimbledon with a white trench coat — the first time at a tennis competition. The look was completed with a white dress, sneakers and headband. "You know, I absolutely love trench coats. I just love coats. I'm always buying Burberry coats. I mean, I love coats. And I don't know why because I live in Florida. So it doesn't really add up," Williams told the Los Angeles Times about the look. Williams looked colorful at the 2010 French Open with a teal dress with a pleated skirt and pink trim. She accessorized the look with a bright-pink headband and wristband. Williams made leopard-print athletic at the 2014 U.S. Open when she arrived in a hot-pink leopard-print dress with a matching headband. 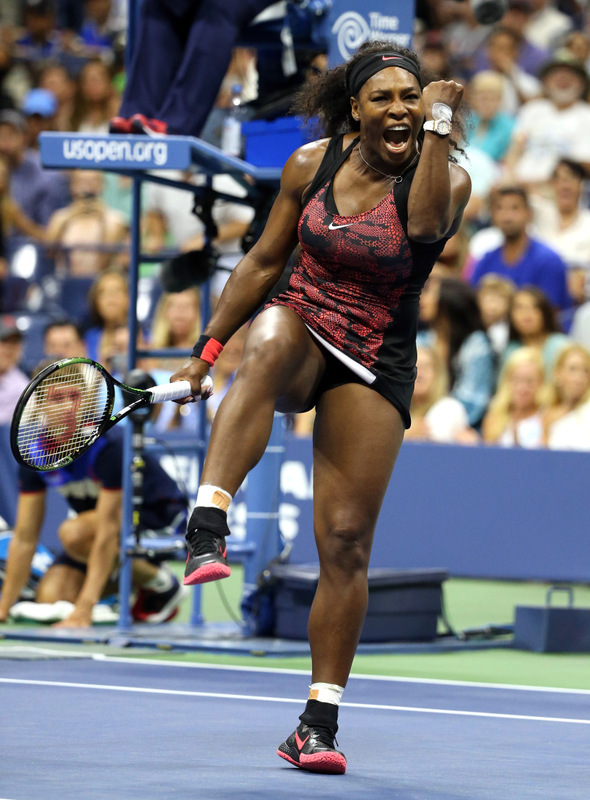 Williams looked fashionable at the 2015 U.S. Open in a pink-and-black faux snakeskin dress. “We always pull out all the stops for the Open. I’m always asking my friends in fashion about what’s the new color, or the latest trend, so I can translate that in our collections," she told The New York Times about the look. 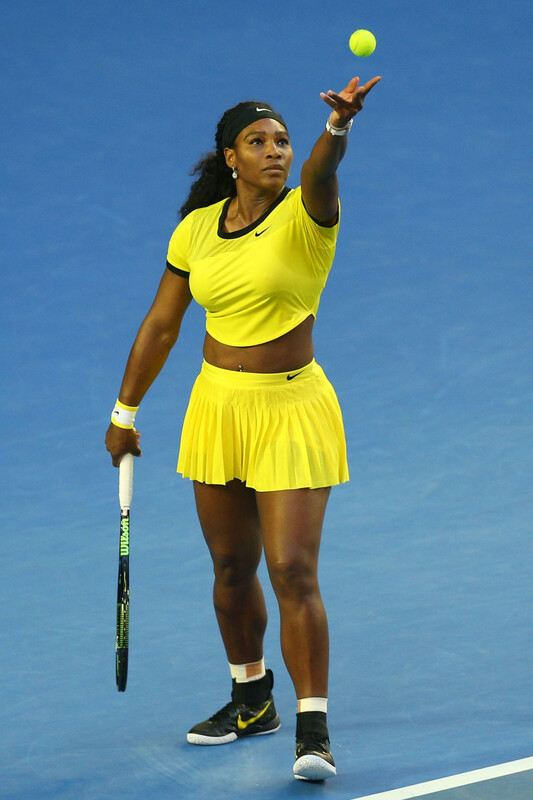 Williams wore yellow on yellow at the 2016 Australian Open. Her look consisted of a bright-yellow crop top with a matching airy skirt. "A lot of things you see onstage and, you know, just in that pop culture world, I wanted to bring that youth and that fun-ness to it," she said about it. 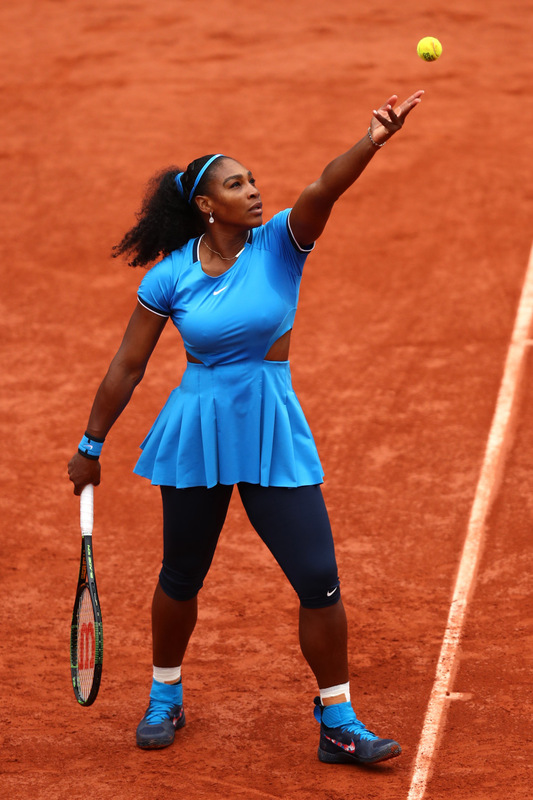 Williams accented her blue Nike skirt and crop top at the 2016 French Open with black leggings. Her Nike sneakers also had a secret detail: The swoosh featured a rose pattern, which was a nod to Williams' favorite flower. 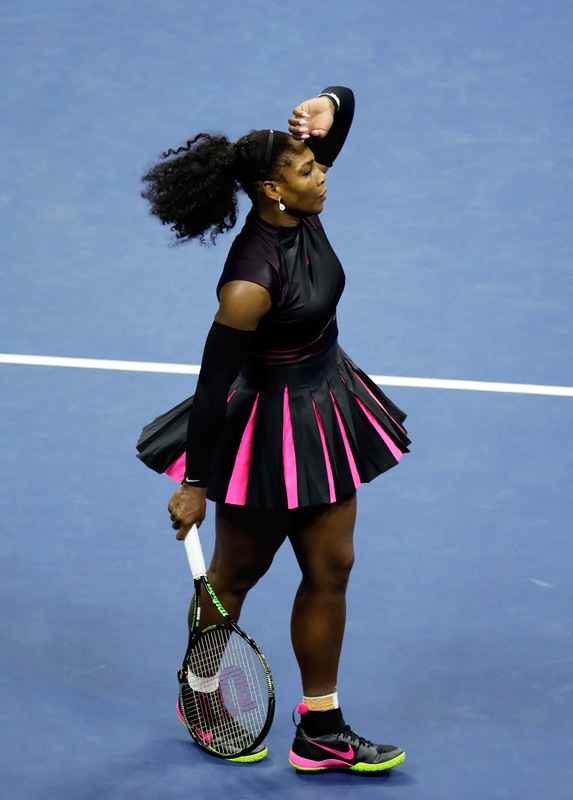 Williams wore an all-black outfit — with the exception of her skirt, which included hot-pink pleats — at the 2016 U.S. Open. 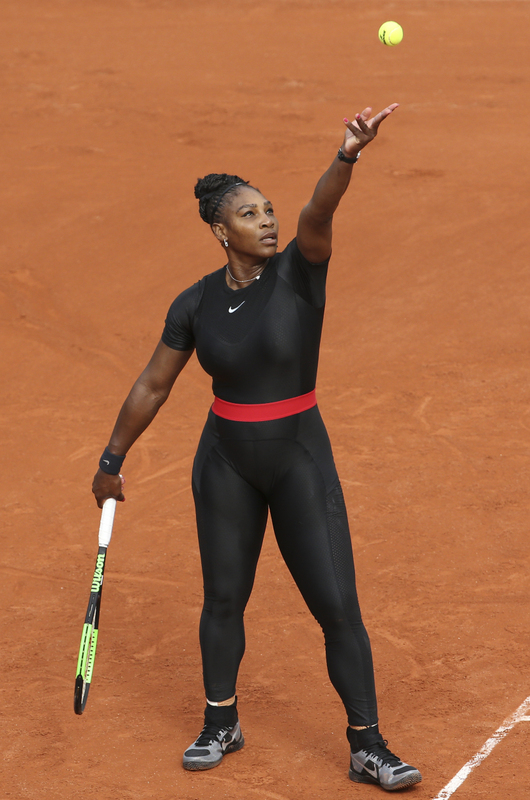 Williams made a statement with her black catsuit at the 2018 French Open. The look, which also included a red band around her waist, was to protect her against blood clots as a new mom as well as serve as a message to "all the moms out there that had a tough pregnancy." Despite this, the look was later banned by the French Tennis Federation, creating controversy. For the 2018 U.S. Open, Williams wore a black tutu with a one-shoulder top designed Virgil Abloh for Nike's Off-White collection. Williams asserted that the look was aerodynamic and didn't hinder her playing. "The tutu is easy to play in because I practiced in it before. That was fun," Williams told CNN. 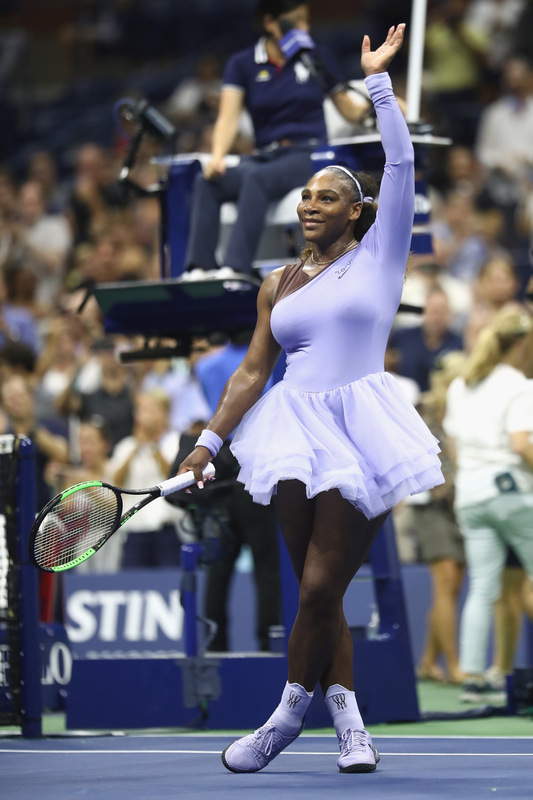 For the second day at the 2018 U.S. Open, Williams wore a similar tutu consisting of a light-blue color and a bare shoulder.